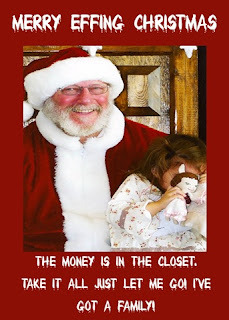 I entered Parenting By Dummies' Merry Effing Photo Contest with a classic picture of Roo rejecting Santa Claus. Okay, so maybe it's more like a picture of Roo's old friends blankie and doll-doll with Santa Claus. Look at what a lovely card Dumb Mom (no, we're not related) made our cherished holiday memento into! Now comes the fun part- you can vote for it so we can win some nifty prizes including some toys for the kids and a School of Rock DVD for mommy's slightly embarrassing Jack Black crush. All you have to do is leave a comment on the post saying you want to vote for #23. You can do this once per day. The other contestants are pretty cute (I am especially amused by the nose-picking triplets) but ignore all that and vote for my kid. #23! #23! #23! lol...some of her captions were what really made the picture hilarious! The nose-picking triplets was pretty cute, like you said, but I also liked the one where Santa quit. But I'll "ignore all that" and vote for you...hehe. :) Good luck! Hope you win! It's all about the Benjamins, baby! That's what I like to say when people are offering me bribes. Wait, who said anything about bribes? Oh, I can not, will not accept a bribe of any sort. That would be so wrong. Not that you need to bribe anyone anyway. Your pic is AWE-SOME! #23! #23! #23! I love that picture! And your caption is too funny! I have a similar picture of me when I was a kid. Except I don't have a cool caption to go with it!